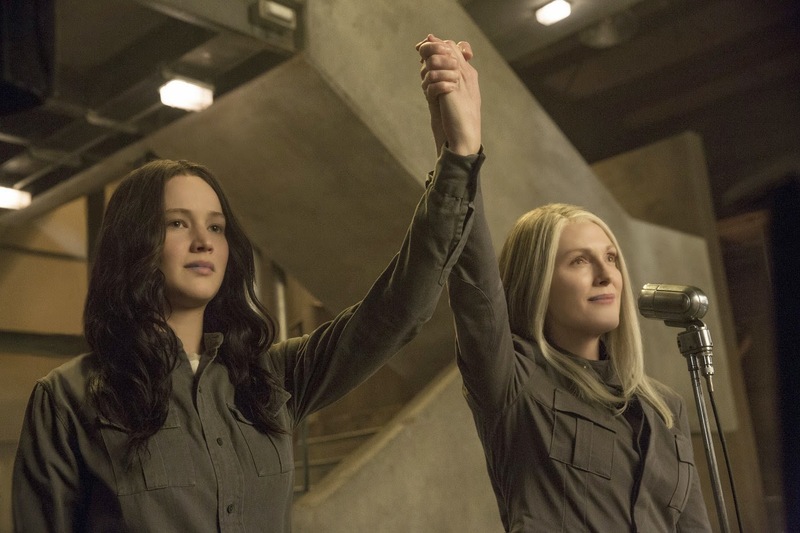 I get that the film would have Hunger Games survivor and District 12 heroine Katniss Everdeen (Jennifer Lawrence, who could play this role in her sleep by now) riddled with survivors guilt and suffering from post-traumatic stress. But the closing shot of “Catching Fire” showed a face ready for retaliation. Instead, we’re given cowering Katniss who must be coaxed into becoming and being marketed as the symbol of the rebellion. But hasn’t she been that for the last two movies? Ever since volunteering for her younger sister it has become the catalyst for the uprising. So I expected some more actual uprising. Instead we trod into the depths of the mysterious District 13 which is almost run in a similar police state by steely President Coin (Julianne Moore) but without the couture of the Capitol. Of course, this place isn’t nearly as bad as actually being ruled by the evil President Snow (Donald Sutherland) and his malevolent regime who insist on murdering members of the districts on live TV who show the slightest attempt at revolting. District 12 was destroyed but we’re only shown the aftermath. Trailer for The Hunger Games: Mockingjay - Part 1 on TrailerAddict.